Traditional MySQL Replication provides a simple Primary-Secondary approach to replication. There is a primary (master) and there is one or more secondaries (slaves). The primary executes transactions, commits them and then they are later (thus asynchronously) sent to the secondaries to be either re-executed (in statement-based replication) or applied (in row-based replication). It is a shared-nothing system, where all servers have a full copy of the data by default. There is also semisynchronous replication, which adds one synchronization step to the protocol. This means that the Primary waits, at commit time, for the secondary to acknowledge that it has received the transaction. Only then does the Primary resume the commit operation. 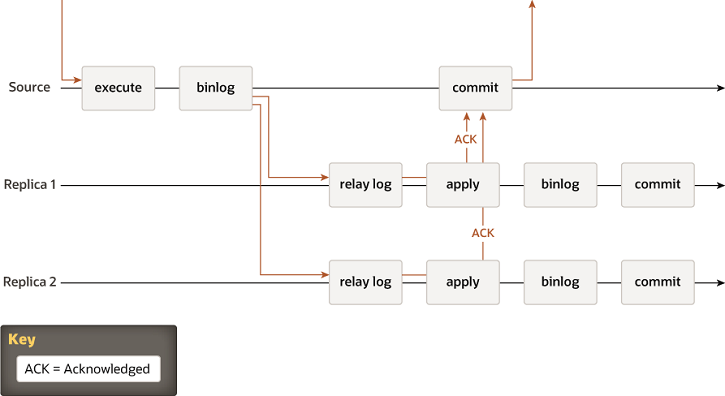 In the two pictures above, you can see a diagram of the classic asynchronous MySQL Replication protocol (and its semisynchronous variant as well). Diagonal arrows represent messages exchanged between servers or messages exchanged between servers and the client application.